Dore Abbey is a superb medieval church at the southern end of Herefordshire's Golden Valley that once served as the church of a Cistercian abbey. The abbey was founded in 1147 by monks from Morimond in France - the only daughter house ever founded by Morimond. The church was begun in 1175 and consecrated one century later. The consecration was quite an affair. 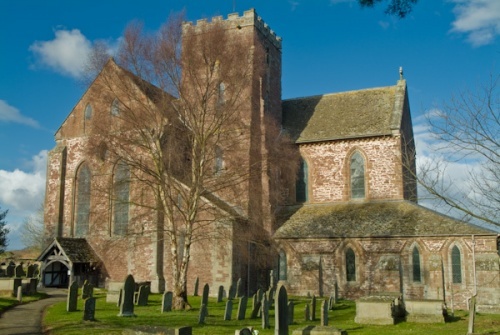 It was conducted by St Thomas Cantilupe, Bishop of Hereford (see Hereford Cathedral), over the objections of the Bishop of St Davids, who claimed jurisdiction over the area. Cantilupe expected trouble, and posted armed guards around the abbey church! The monks were skilled at raising sheep, and the fleece from Abbey Dore was exported as far afield as Italy. But the prosperity did not come without a cost; the abbey's location so close to the Welsh border meant that it was subject to Welsh raids. In 1405 the abbey narrowly avoided being sacked by Owain Glendower. The end came, however, at English hands, when Henry VIII dissolved the abbey in 1537. 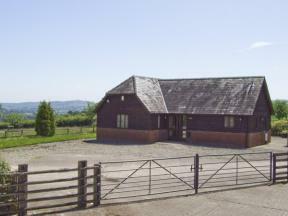 The property was purchased by Lord John Scudamore. Scudamore tore down the abbey buildings, all except for the church chancel, and sold the material as building stone, leaving little beyond foundation walls and a roofless shell of a church. Rescue came from an unexpected source; by 1630 Scudamore's great great grandson, Viscount John, had grown frustrated with his inability to produce a male heir that would live beyond infancy. Archbishop Laud suggested that his troubles were down to his ancestor's actions in denuding the abbey. So, as retrospective penance, Viscount John restored the abbey as a parish church, and it was reconsecrated in 1634. Did the penance work? You judge ... Scudamore's next child was a son, who lived to adulthood, thus ensuring the Viscount's succession. Archbishop Laud's coat of arms in depicted on the rood screen, as is that of Charles I and Lord Scudamore. The original altar stone was discovered serving as a slab for salting meat at a nearby farm, and restored to the abbey. Around 1700 the church underwent a further restoration, at which time a number of striking wall paintings were added. In 1900 the church was restructured again so that the current church is only the original presbytery! It is staggering to realize that the standing structure we see today was only the chancel and transepts of the original 12th century church. One particular feature of note are the collection of carved stone roof bosses. These were carefully preserved when the church was dismantled at the Reformation. One particularly fine boss, depicting the Abbot of Dore kneeeling before the Virgin and Child, has been shown in exhibitions across Europe. Other interior highlights include a beautifully carved Carolean screen made by John Abel and bearing the arms of Charles I, Archbishop Laud, and Viscount Scudamore. To the south east of the crossing is the Hoskyns Chapel, with the tomb of John Hoskyns used as an altar slab. Hoskyns spent time in the Tower of London under James I, but in a happier time he entertained the king with a troup of 10 Morris dancers whose combined age was said to total 1000 years! The stone slab that forms the high altar is part of the original medieval altar, and still bears consecration crosses. It was found at a local farm being used as a salting slab. On either side of the altar are floor tiles dating from the 13th century. On the north wall is a small effigy thought to represent Bishop John de Breton of Hereford (1269-1275). The effigy was found in a small recess in the north ambulatory wall and probably marked a heart burial. On the south ambulatory is a broken effigy thought to be that of Roger Clifford (c. 1280). The head of the effigy is a moder replacement, made after the original was stolen in 1985. The interior architecture is superb, and there is a sense of great height and light in the interior of the church. The remains of the Cistercian abbey buildings stand outside the church, and the layout of the medieval buildings is easy to see and explore. A short distance away is Abbey Dore Court Garden, a 6 acre plantsman's garden of particular interest to keen gardeners. It has to be said that access can be a problem! There is no parking at the church, and don't even think about parking along the lane that leads past the churchyard gate; despite the rural location there is a lot of traffic, and walking along the road isn't something I'd recommend. Your best bet is to park in the small lane immediately north of the church that leads to the village hall. From there you can walk down a farm drive, with the abbey church straight ahead in view the whole time across a field. The drive leads to a gate into the churchyard, but there's no obvious signage to indicate that this route is an option. However, it is well worth the walk! I've been to Dore Abbey several times, and each time I come away shaking my head in amazement. The interior is so spacious as to seem huge, the rival of a small cathedral. There are so many medieval pieces of carving, so many pieces of fine woodworking, wall paintings, and monuments, that to describe them all would take an hour. Suffice it to say that Dore Abbey is one of the most enjoyable medieval churches in England, and an absolute delight to visit. Location: In the middle of Abbey Dore on the B4347 between Hay on Wye and Pontrillas.